Anchorage – Next month, the United States Department of Health and Human Services will honor Representative Les Gara (D-Anchorage) for his career of work to improve the opportunity and lives of foster youth and families. Rep. Gara will receive a 2018 Adoption Excellence Award during a ceremony in Washington D.C. 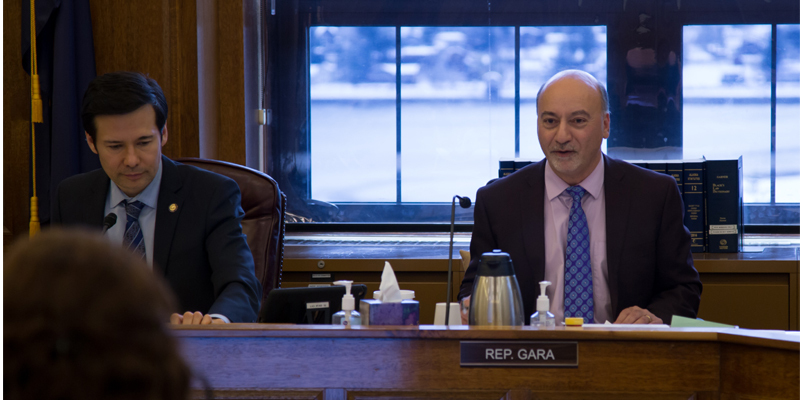 In being chosen for the award, Rep. Gara was praised for his extraordinary contributions to provide permanent, healthy outcomes for children in foster care in Alaska, including through landmark reform legislation passed this year. Rep. Gara was nominated for the prestigious national award by Amanda Metivier, who founded the foster youth advocacy and support organization, Facing Foster Care in Alaska. Metivier has garnered praise for her child protection work at the Child Welfare Academy at the University of Alaska Anchorage. Rep. Gara and Amanda Metivier both grew up in foster care, and last year Rep. Gara joined Metivier in becoming the only Alaskans ever to be honored by Casey Family Programs with their prestigious Casey Excellence for Children Award. In June, Alaska Governor Bill Walker signed a landmark piece of legislation sponsored by Rep. Gara into law. House Bill 151 reforms Alaska’s foster care system by implementing comprehensive national best practices, including strong training and workload standards for caseworkers to get youth out of foster care more quickly, with less emotional damage, and to increase placements with loving family members. “Quyana (thank you) to Representative Gara for your tireless advocacy for Alaska children and families in our foster care system. This well-deserved recognition honors your years of work to ensure that children are at the center of child welfare reforms in Alaska,” said Alaska Department of Health and Social Services Commissioner Valerie Nurr’araaluk Davidson. Rep. Gara’s work to improve Alaska’s foster care system includes increasing college scholarships and job training to increase success for foster youth and starting volunteer foster youth mentorship and laptop computer donation programs. Rep. Gara successfully passed legislation extending foster care to age 21, when a youth needs a home, which has since become the case in over 40 states. Rep. Gara also successfully reversed a ban on allowing foster youth who’ve asked to leave foster care to return when they realize they made a mistake going out on their own, and a home is in their best interests. The Adoption Excellence Award program was created by the U.S. Department of Health and Human Services in 1997 to recognize outstanding accomplishments in achieving permanency for America’s children waiting in foster care. Rep. Gara has been chosen to receive this year’s award in the Individuals/Professionals category. The 12 recipients of the Adoption Excellence Awards will be honored during a ceremony on November 13 at the Hubert H. Humphrey Building in Washington D.C. The ceremony is being held in conjunction with an event to highlight the federal government’s National Adoption Recruitment Campaign. “Every child deserves a family, so they can feel safe, supported and loved. We should work to make sure they have the same opportunities and success in life as their peers. That is both a moral imperative and saves state spending on youth who do not succeed, or end up in jail or homeless,” said Rep. Gara. For more information, please contact Rep. Les Gara at (907) 250-0106 and Amanda Metivier at (907) 230-8237.